O-Pee-Chee has never been much for the big hits. It's about building sets and nostalgia. 2014-15 O-Pee-Chee Hockey sticks with this theme, delivering the sport's biggest base set of the year and lots of old-school elements. 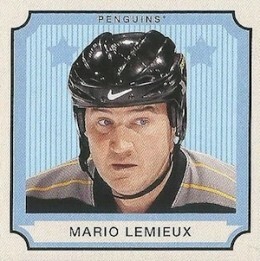 The 2014-15 O-Pee-Chee Hockey set has a total of 600 cards. This includes a 500-card base set and 100 Marquee Rookies and Legends short prints. Inserted 1:2 packs, short prints aren't a massive challenge. Evgeny Kuznetsov and Teuvo Teravainen are among the rookies in the set. Every pack comes with one Retro parallel. There are also Rainbow Foil (1:4 packs) and Black Border (#/100) parallels. Sticking with the throwback theme are new V Series A inserts. The square cards are inspired by pre-war hockey card designs and land two per hobby box. Stickers return for another season. Relatively easy to find, they're inserted 1:3 packs. 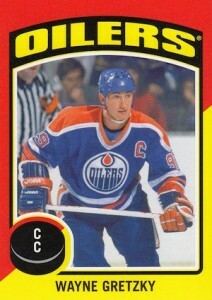 Also returning in 2014-15 O-Pee-Chee Hockey are Team Logo Patch cards. Combining to fall four per case (1:96 hobby packs), this is the third and final installment of the program. As with past years, there are several tiers of rarity meaning some are tougher to find than others. The manufactured patches go back almost 100 years and feature a mix of regular, cartoon and commemorative logos. Although autographs are not a major focus in the product, some are randomly inserted. 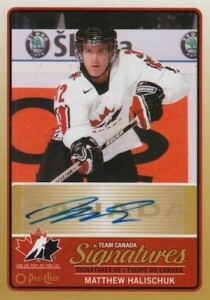 Each hobby case averages three O-Pee-Chee Signatures and one Team Canada Signature card. Collectors can also find Sport Royalty Autographs and Buyback Autographs. 2014-15 O-Pee-Chee Hockey features a wrapper redemption program. When collectors gather the appropriate amount of hobby wrappers, they can exchange them for a pack of five Red parallels and a new Mini Tall Boy insert. Checklist will be updated as info becomes available. 42 cards. More info here. Good: ig checklist, focus on fun, retro appeal, unexpected surprises. Bad: Lack of rookies, too many parallels. The Bottom Line: Ever since Upper Deck brought O-Pee-Chee back to the ice, they’ve made it a reasonably priced product led by a large checklist and a vibe from the past. 2014-15 O-Pee-Chee Hockey is no different. However, its early release works against it as a set-building product due to its lack of rookies. Outside of that, though, it’s a fun project. While not much has changed overall, there are a couple of added parts that weren’t announced. Granted, they’re super tough to find so not everyone is going to get a chance to find one. As always, there’s a retro vibe that runs throughout O-Pee-Chee. And I like it. Base cards are solid on every level except for the lack of bios to fill up some of the card backs. But that’s okay if the trade-off means full stats for every player, which I think is more important in a set like this. The small photo on the back is another nice touch, even if it’s a cropped take on the one from the front. Although I’m getting bored of the Stickers as an insert set the bright colors in this set are fun. They remind me a lot of 1975 Topps Baseball. The new V Series inserts are solid, although some might not like the smaller size as much. That said, I like that Upper Deck opted for a standard width. This makes storage much easier. With a checklist of 600 cards (not including the unannounced short prints), this is a set targeting set builders. And while that’s a good thing, its earlier release hinders things because a lot of the rookies that will be creating the most interest are missing. While there is no shortage of rookie cards, few of them feature high-profile players. As a fan of the brand and making sets, I’d love to see this as a pre-Christmas release so that at least some of the rookies that crack Opening Night rosters have a chance to be in here. 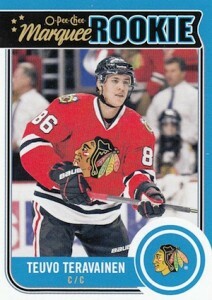 Yes, there’s the OPC Update cards in Upper Deck Series 2, but that’s not the same to me. While I love the idea of unannounced cards, the additional base cards that are very tough to get are a little much. Collectors are already looking at a decent-sized challenge. The SSPs might work against the set as some might see it as too much. 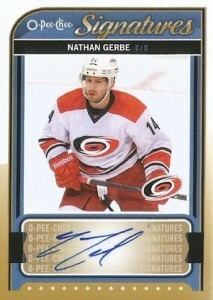 I do like that Upper Deck has developed the O-Pee-Chee brand without focusing on autographs and memorabilia. Things like the manufactured patch cards and occasional signed card make them more interesting. The average box of O-Pee-Chee isn’t going to get you something massive. But at the same time, it’s one of the most affordable boxes in the hobby. This makes the product more about the experience rather than crossing your fingers that there’s a big hit waiting. This makes the short prints, 3D cards and other rarities that are inside that much more special. But even in a “worst case scenario” where you’re left with a huge stack of base cards and a bunch of basic inserts, you probably won’t be feeling too bad about it since it doesn’t have the risky feeling more expensive products have. 2014-15 O-Pee-Chee Hockey isn’t flashy. It’s not groundbreaking. It doesn’t have a killer checklist. But it is fun for those looking for a simple product that primes them for the season at hand (and recapping last year). 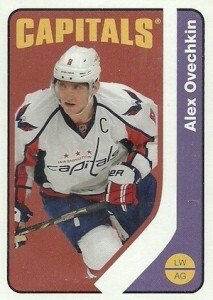 O-Pee-Chee is at its best when sticking to the basics and tossing in a handful of extras to spice things up a little. 14-15 O-Pee-Chee Platinum Evgeny Kuznetsov Auto Rookie Blue Rainbow 25! Rc! Not really fair to ‘review’ them, since I don’t have them. But so far, I don’t really like the look of this season. I love the 12-13 set. I thought the art design of those was really classic and tasteful, in a sort of ‘post nuclear’, retro sort of way. However, these next two sets seem much more late 70’s… in a funky color, psychedelic way… which I’m really not into. But I’m just glad they do the sets, because they’re really creative and offer something very unique, compared to the other hordes of modern card sets. To me, these and the Score sets are the perfect combination. This an essential family product. It’s a natural for Hockey collectors. Life would not be the same without it. Simply when you talk Hockey collections you immediately think OPC. been associated with Hockey. Buying a pack, a box or a case is like meeting a very old reliable friend year after year. Just keep up the same patern, that’s how we like you. Awesome! 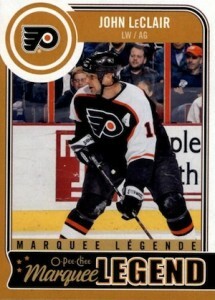 ANOTHER DOUG WILSON CARD!!! And now Arturs Irbe, Bill Ranford and Rob Brown too!! Last year was great without the Marquee Legends. Too bad they brought back this pointless subset. Again. Great product. Collation was improved over years past. There are some great “Easter Eggs” in this product besides the blank back cards. Award Winners and All Time Greats are part of the base set. 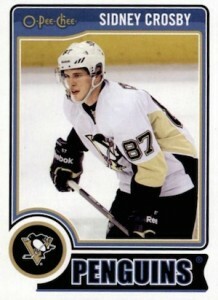 It also doesn’t hurt that I pulled the Sports Royalty Sidney Crosby Autograph. If the target audience of this product is Set Builders then someone has failed miserably. Just because 10 people may attempt to do it does not make it so. I would love to see Cardboard Connection come up with an additional rating system with regards to price point AND set building, because you’re not going to spend low-end money trying to build this set.